‘Tis the season to be scary, and as such, us folks at Power Up Gaming have been thinking about the ways in which video games have petrified us over the years. There are plenty of outright horror games out there, but sometimes, moments of true terror can come when you least expect them; most notably from those games that aren’t necessarily supposed to be frightening. Whether these are fleeting moments of panic or just games that have a sinister, underlying tone, here are our scariest moments in what are considered to be non-scary games. For me, one of the most terrifying moments of my childhood stems from the deep, dark ocean. Sure, many people have an aversion to open water, but I’m talking specifically about a 16-bit ocean in a game that is cutesy on the surface, but has deep trenches of horror lurking beneath. I am of course referring to Ecco The Dolphin. The game starts off nicely enough with a short opening segment where you get to leap and play amongst the surf with a pod of Ecco’s friends. Then all of a sudden, all of your companions are sucked through some kind of wormhole, and from then on, the game takes on a creepier, more sombre tone. You begin to explore the empty void of the ocean as the light dwindles away and more hostile enemies appear. Even the music turns into something with an eerie sense of dread. Then, right before the end of the game, you have to defeat a giant, floating, Geiger-esque monstrosity in total darkness (pictured above). As it turns out, aliens were behind the earlier abduction, and Ecco is the only one who can repel their invasion and save his aquatic friends. Combining grotesque aliens with deep water is enough to give anyone aquaphobia. At the very least, it has always made a little trepidatious when presented with expanses of water in video games. I know most people probably remember The Legend of Zelda: Ocarina of Time as a masterpiece of gaming, but few probably remember it for its instances of very mature, and ultimately startling, images and dialogue found within Hyrule. Yes, creepy to say the least. Oh, and then there is the boss in the Shadow Temple, Bongo Bongo. Don’t even get me started on him. Honestly, I’m not sure how I survived all of these encounters as a wee lad. Sometimes when I go back to revisit the land of Hyrule, I find myself turning off the old Nintendo 64, more times than not, due to the imagery. Some might argue that Ocarina Of Time is indeed a dark game, and sure, it might be, but that doesn’t make me forget the nightmares I had as a kid because of a seemingly innocent adventure game, filled with fairies, swords, and fish people. The scariest moment in any non-scary game for me is by far from Metal Gear Solid 2: Sons of Liberty. No, I’m not referring to the confusing storyline, although that did cause me to spend many-a-night trying to figure out what exactly I just spend hour playing. The moment (or should I say moments) I am referring to are the codec calls from the Colonel while in Arsenal Gear near the end of the game. From the moment I stepped into Raiden’s shoes and started talking to “The Colonel,” I realized something was amiss. This was obviously supposed to be Colonel Roy Campbell I was talking to: a stoic sounding man when he helped me though Shadow Moses in Metal Gear Solid; at least that’s the vibe I got from him. That Colonel sounded like a man who had seen a lot of time in the field and was now commanding people from afar in missions all across the world. I was expecting something different. I was expecting something tragic and thought-provoking. Well, I got thought-provoking, that’s for sure. 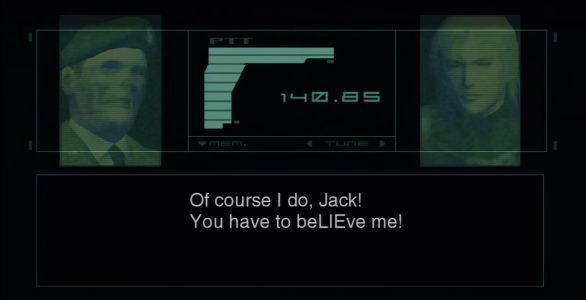 What I wasn’t expecting was the paranoia I would experience with every codec call I get resulting in a face full of Colonel Skeletal and fake Rose, Raiden’s wife. Apparently, “The Colonel” is a fake; part of an elaborate ruse put on by The Patriots to create more Solid Snakes for Foxhound. This copy of Roy Campbell was to be used in order to simulate the same assistance Snake received during Shadow Moses for a training program known as S3, The Solid Snake Simulation. After the A.I. became corrupt with the digital Fox Die strain, it became hostile and taunted the player with every call, taking away the support that was present all throughout the game. It also began to manipulate the nano-machines within Raiden’s body and started to create distractions on screen, similar to how Psycho Mantis affected Solid Snake in the previous game. Not only was it unpleasant to look at, but it was also a major handicap for the rest of the game. With the ominous music, distorted and confusing codec calls, as well as enemies at every turn with no initial way for the player to fight them, it made for a deliciously traumatising experience that I will absolutely never forget. At 11 years of age, I really had no right taking a virtual trip through the streets of Half-Life 2’s Ravenholm. The abandoned, vaguely Eastern European-resembling apartments and streets littered with half-sawed apart zombie corpses wasn’t the most pleasant sight, for one. That most of the town was shrouded in darkness, with only a priest-turned-madman to comfort you, didn’t help either. Revisiting Ravenholm years later for the gazillionth time, the level still gets to me. Perhaps most interesting about the chapter is just how little it relies on jump scares. In fact, the only jump scare I remember is the sudden fall of two fast headcrabs before the player’s feet. The rest is pure, unwavering tension. I still struggle with convincing myself to make that mad dash from one building to another with the wretched fast zombies prowling about on the rooftops. Every time I play through it, I can’t help but cower in the corner for a few minutes, shutting all doors and knowing fully well that taking a few steps forward outside will trigger the next scripted encounter with the fast zombies. In hindsight, the fast zombies aren’t even all that difficult to dispose of, but there’s something about their ghastly screams and design that forever haunts my memory and gives me great pause upon each subsequent playthrough. It makes it all the more ingenious that there’s literally a light at the end of a tunnel near the chapter’s conclusion. It’s a terrific design choice to make players pause and reflect on the ordeal they just experienced and how relatively awesome Combine soldiers are in comparison. So, there are our picks, but what are your favourite scary moments in non-scary games? Have you ever been creeped out in a cutesy platformer? Or jumped out of your skin when a relaxing game suddenly changes tack? Let us know in the comments below. Happy Halloween!